WASHINGTON — It was not quite the Tony Blair-Bill Clinton love fest of 1997, but President Obama and the newly minted British prime minister, David Cameron, appeared game to do everything they could on Tuesday to take some of the recent chill out of the relationship between their countries. Standing side by side in near-identical dark blue suits and blue ties in the East Room at the conclusion of Mr. Cameron’s first visit to the White House as his nation’s leader, the two fortysomethings systematically papered over the few areas of daylight between the United States and Britain (stimulus spending versus deficit reduction, the pace of withdrawal from Afghanistan, the need for an inquiry into the release by Scotland of the only person convicted in the Pan Am bombing over Lockerbie). Instead, before the assembled press corps of Washington and Downing Street, they joked about cold beer versus warm beer, whether their children kept their bedrooms tidy and the England-United States World Cup soccer match that ended in a tie. “While at the World Cup our teams could only manage a score draw, I believe our relationship can be a win-win,” Mr. Cameron said, neglecting to mention that the United States still managed to emerge the winner, over England, of its World Cup group. Even on one of the main areas of substantive disagreement — the release of Abdel Basset Ali al-Megrahi, the Libyan intelligence agent who had served eight years of a life sentence for his role in the December 1988 bombing of Pan Am Flight 103 over Lockerbie, Scotland — the two seemed determined to project the impression of being in lock step. But Mr. Cameron, who as leader of Britain’s opposition at the time had objected to the release, said that he did not see any point to an additional investigation into the circumstances of Mr. Megrahi’s release, an investigation that Mr. Obama supports. Mr. Cameron also said he had no reason to believe that BP had anything to do with the much criticized decision to release Mr. Megrahi from a Scottish prison last year to win oil concessions from Libya. He and Mr. Obama both strongly condemned the release, which the Scottish government decided on compassionate grounds after doctors there testified that Mr. Megrahi was likely to die of advanced prostate cancer within three months. He is still alive and living in Tripoli, Libya. “It was the biggest mass murder in British history, and there was no business letting him out of prison,” Mr. Cameron said, adding that he and Mr. Obama were in “violent agreement” on that. The first formal visit between an American president and a British prime minister is always fraught with historical significance. The two Western powers make much of their vaunted “special relationship,” which Mr. Obama, who never seemed to warm to Mr. Cameron’s predecessor, Gordon Brown, mentioned twice during the news conference; Mr. Cameron once. In this case, not only is Mr. Cameron new to his job, but as leader of the Conservative Party, he is ideologically more distant from Mr. Obama than was Mr. Brown, who was leader of the Labour Party. 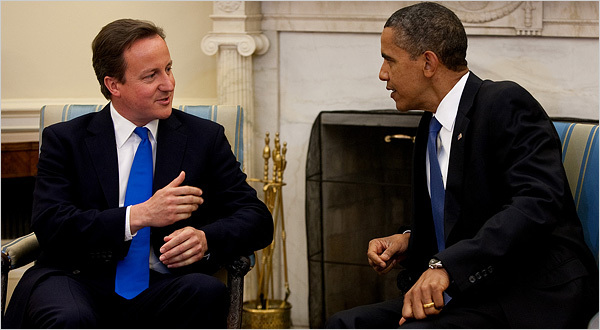 Mr. Cameron’s first visit to Washington as prime minister was meant as a way for he and Mr. Obama to tackle a series of issues vital to the two countries, in particular the war in Afghanistan and steps toward a global economic recovery. But the BP oil spill, and a decision by the Senate Foreign Relations Committee to hold hearings on July 29 on Mr. Megrahi’s release, dominated the joint news conference after the White House meetings. Lawmakers who pressed for the Washington hearing on the release — including the senators from New York, New Jersey and California, home states to many of the 189 American bombing victims at Lockerbie — have demanded that BP explain its role in lobbying for the prisoner-transfer agreement Britain and Libya concluded in December 2007. The senators have said they want to explore possible links between Mr. Megrahi’s release and BP’s eagerness to win Libyan ratification of an offshore oil deal that company officials have said could be worth $20 billion. Brian Knowlton contributed reporting from Washington and John F. Burns from London.